A good Google My Business profile can have a dramatic effect on how well your business performs in local business searches on Google. You gain visibility in the ‘local pack’ search results on page 1 of Google – which shows the most relevant or nearest businesses to a searchers location and ranks them higher than the top organic search results. You gain visibility on Google maps so that customers can get directions to your business – which is vital if you have a store front and rely on footfall. Your credibility is increased online thanks to Google Reviews that your customers can leave easily via your business listing on Google. Your customers can gain easy access to your phone number, opening hours, address and website. You can set up multiple service areas. So if your business has multiple locations you can ensure the customer will see the closest location at the time they conduct their search. How do I get started on Google My Business? Visit https://www.google.com/business/ and click on ‘Start Now’. Enter your business name, location, contact information and category then click ‘Continue’. Follow the remaining prompts to verify that you are authorised to manage your businesses. Alternatively you can visit Google Maps and search for your business address. Once the address has been found you can then click on ‘Add a missing place’ to add your business details. How do I verify my business on Google My Business? You will receive a verification postcard from Google about two weeks after requesting a business verification. Once the verification postcard arrives visit your Google My Business account and click on ‘Verify Location’ in the left menu or click the ‘Verify Now’ button at the top of the page. You will then need to enter the verification code from the postcard you received. Some types of businesses can verify their business instantly using email, phone or Google search console. Visit Google’s local business verification page to find out if you can take advantage of this. The postcard from Google can easily be mistaken for junk mail so make sure everyone is aware of the postcards importance to avoid it being thrown out. Visit and sign into your Google My Business account and select ‘manage location’ from the locations section. From here you can visit the ‘info’ section to add or edit your business contact information and add attributes – such as accessibility, amenities and planning details. If you have multiple locations you can also add store codes and custom labels to differentiate them from each other. Accurate NAP details (Name, address and telephone) is considered to be a quality signal for Google, especially if your NAP details are consistent throughout the internet. The more information you can add to your profile the better. This includes simple but essential details such as opening times or mentioning a local landmark that could help customers find your premises more easily. Visit and sign into your Google My Business account and select ‘manage location’ from the locations section. From here select ‘photos’ from the main menu or click on ‘manage photos’ to take you directly to the photos overview page. To upload an image click on the camera icon and select an image in either JPEG or PNG format. Be sure to add a range of images using the photo categories. For example, interior photos can be used to showcase the personality of your business whereas exterior photos could be used to help customers locate your premises. Adding a 360 photo is a great way to allow customers to interact with your business. A restaurant for example could allow customers to ‘walk around’ inside to get a feel for the atmosphere. Most modern smartphones support apps that can take 360 degree photos. What is the Google Local Pack and why is it important? 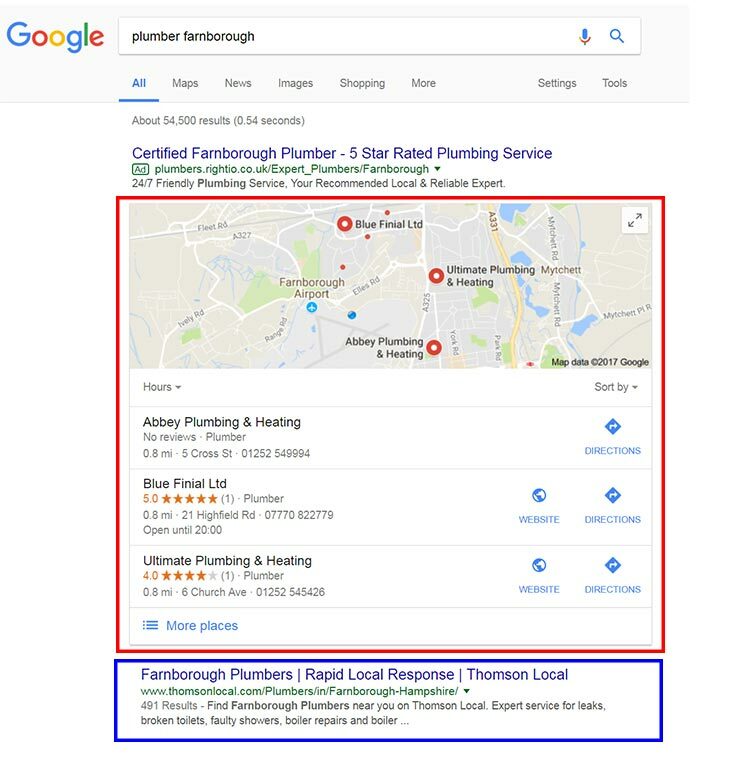 If you perform a Google search for a service along with a location (such as Plumber Farnborough) you will see a map along with three local results for your query displayed below the PPC results. This is the local pack – essentially the three nearest or most relevant local businesses based on your search query. The red box shows the Local Pack result. The blue box shows the first organic result. How do I get my business into the Google Local Pack? Let’s take a closer look at each of these below. Where possible, try to fully complete all the various sections of your Google My Business page. Key areas to focus on include your NAP details (Name/Address/Phone Number), photos (Interior/Exterior/At Work, etc) and your opening times/hours. Ensure your company name exactly matches the name currently registered with company’s house or similar organisations. So if you are registered as ‘Bobs Plumbing Ltd’ make sure you list your company name in the same format on your Google My Business profile. 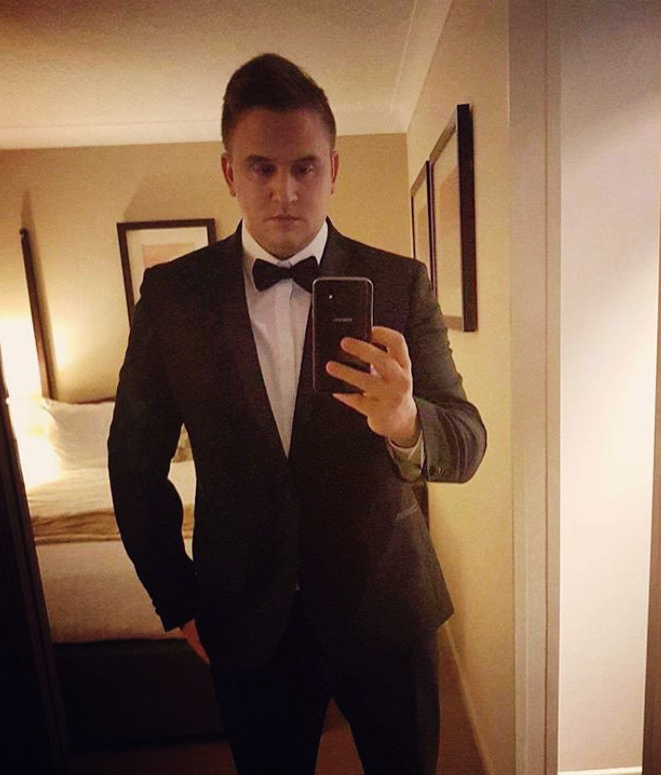 Make sure your photos are as professional looking as possible. Most modern smartphones can be used to add subtle filters to bring out details and colours. Why are local business NAP citations so important? Google places a great deal of value on your NAP details and relies on trusted data websites to help validate the accuracy of your NAP. If Google finds any inconsistencies, such as old disconnected phone numbers and previous addresses, it’s possible that they may place less trust in your most current NAP details as a result. Remember you can also repeat this step to search for old phone numbers, addresses and other details that are unique to your company – such as email addresses. If you do find any inaccurate listings you can contact the website owners to get the details amended. If you don’t currently have any citations for your business you should rectify this as soon as possible. You can either do this by visiting each citation website to add your details manually or you can take advantage of our Get Me Everywhere citation service to get your NAP details sent out in bulk to hundreds of trusted citation websites. When searching for current citations of your business be sure to check for both versions of your phone number with and without spaces (i.e. 0333 014 5045 and 03330145045). What are Google Reviews and why are they so important? Google Reviews are reviews left by people that have found your business via Google. These reviews and their corresponding stars will appear prominently in Google searches, Google maps and other Google services when people search for your business. Searching on Google is often the first step a customer takes before contacting your business. If the first thing they see is a negative review or a lack of reviews for your business they may choose to contact a competitor instead. If you want to gain more Google reviews or find out ways to gain reviews on other websites such as TrustPilot please visit our Why you need local business reviews and how to get them article on the Thomson Local blog. Do you have any Google My Business tips?